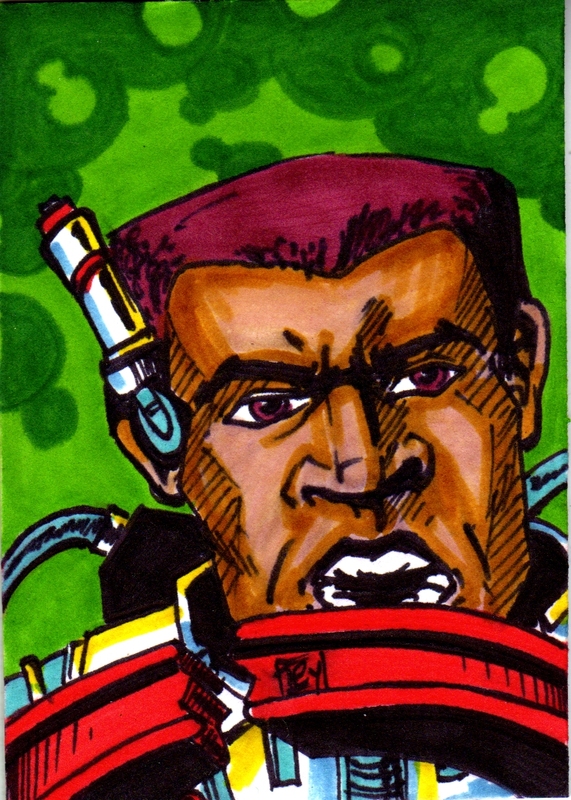 Taylor's Sweet Little Art and Nerd Site: Sketch Card of the Day- Clamp Champ! Today's deviation is Clamp Champ! Clamp Champ, the champion of the... clamp? No, not exactly. He's the heroic master of capture, though I don't think he's ever been able to capture a crowd. Ole' Clampy here was made towards the end of the line, and therefore, in my opinion suffers the overlooking of Masters of the Universe fans. When I was young, I overlooked him, and I believe it had to do with the fact that MOTU was dying down a little. Also, in that lineup for the series the Champ was in, was Ninjor. And if you are playing rock, paper, scissors with a toy lineup and you throw a ninja in, well, the ninja is basically the bomb. It's tough to compete with a ninja, unless you're a panda. Just saying. I never owned a Clamp Champ till I was in my thirties, and I'm glad I picked one up (apparently this character is rather hard to come by in really good shape with his clamping tool). Since then I have sought out the 200X NECA figurine statue and other things Clamp Champ. I've had no luck. All in all, I think this character often gets overlooked, and I think that is just downright "Sad Ninja Panda" master of taking away Clamp Champ's thunder. You can also see this sketch card here.